Today we have had a challenge presented to us. A customer in Helston has a wrought iron metal swinging gate with a lock that has ceased working. Owl Locksmiths and Security arrived to remove the lock with the intention of a replacement or repair on the spot, however, when we saw the lock we realised this was not going to be possible as we did not recognise the type or the manufacturer. 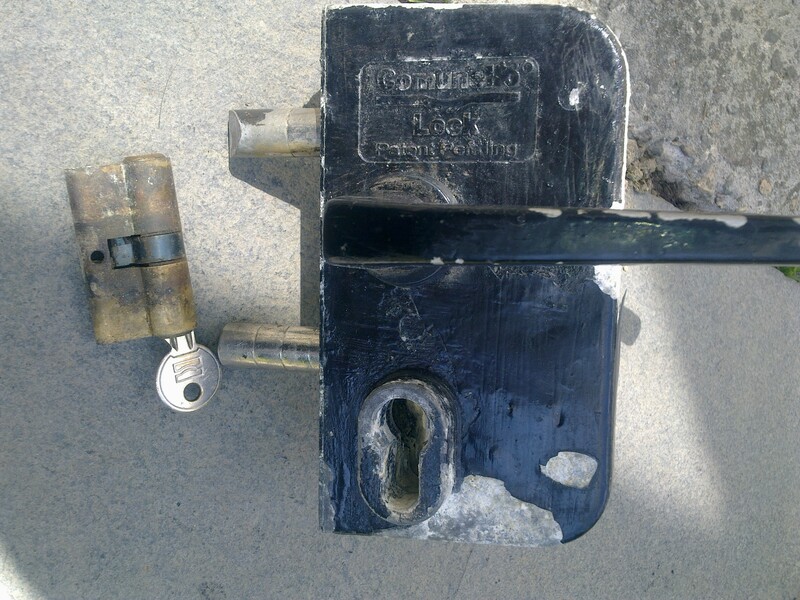 Also, due to the way this lock is fitted to the gate it was also not possible to fit an alternative type of mortice lock that we have in stock or could easily obtain. After making some enquiries we have found that the manufacturers are Italian, Comunello who are based in Northern Italy. We struggled to find any UK based stockists for these locks and resulted to contacting Comunello direct, via email I might add. The move was a success and they put us in touch with a midlands based retailer who was more than helpful. None of this may be required however, as our first step is to strip the lock down in the workshop and attempt to repair or replace parts but experience tells us it is often far more cost effective and reliable in the long run to replace items rather than repair them. Certainly, for general common locks in the majority of doors, it is not worth messing around as bench work (labour) quickly out ways the cost of a replacement, so it is not the locksmith being lazy or inexperienced by simply changing the lock, it is a fact of least expense to the customer. However, on this occasion, this may not apply. Watch this space for the full result possibly by the end of next week.